Sometimes it doesn’t take that much to turn something plain into something exceptional. The down home Elvis sandwich, the PB&B, the peanut butter & banana sandwich, is a blank canvas, a platform standing at the ready for your enhancements. 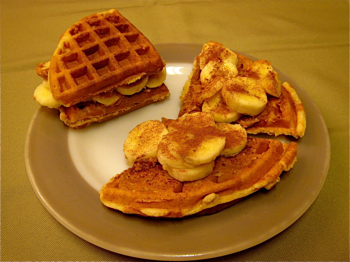 In this installment of the Lay Gourmet, we poked our heads into the kitchen appliance cabinet and felt like playing with the waffle-making waffle iron. 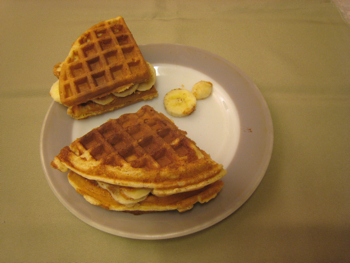 This created our alternate for ordinary sandwich bread – the… you guessed it, the waffle as breadie bookends for our custom sammich-making episode. Instead of using waffle mix we stirred up some cornbread mix, using organic ingredients as much as possible. Buttermilk can work well too, some say it calls for a pinch more baking powder or separated eggs (eggs whites only), but in your kitchen you rule the roost. Pinch or separate or leave it alone, your call. The only change is that the cornbread will be a bit lighter if you do those things. Voila, a sandwich fit for a King. The Big E liked his PB&B pan fried in butter. Whatever, it still can be all-organic. If he’d had me in his entourage he’d still be shaking a leg because he’d eat right and be alive. “It’s a good thing.” Isn’t that the Martha Stewart catchphrase? Are the two above-mentioned celebrity names actually role models for us to emulate? Martha on what’s right and good, and Elvis on sustenance?